I want to update my recipe for black sesame dessert soup. Recently, I attended a soup swap. What’s that, you might be asking. Well, it’s a gathering of sorts involving something like a game. All of the attendees bring six quart-sized containers filled with a frozen homemade soup/stew of their choice. All of the soups are lumped together in a spot in the room. Then, attendees pick out a number, and proceed, in their numbered order, to explain what they brought in. Once this is completed, the guests then take turns picking out a new soup container to bring home. So, you bring over six quarts of your soup, and you bring home six quarts of someone else’s soup. This year, I decided on a Chinese dessert soup – black sesame soup (aka “hak zi ma wu”). Researching only provided me with two recipes that looked usable. The first time I made this soup, I followed recipe #1 exactly. This time around, I followed recipe #1 in general measurements, but tried the methodology of recipe #2. I had hoped that recipe #2 would be a time saver, what with the rice being blended before cooking. In the end, I got a superior result to my first attempt… but it didn’t take any less time. 1. Soak your rice in cold water for at least an hour. 2. In a blender, crush up the sesame seeds. Add half of the rice and crush this as finely as you can. Add about a cup of water, and then blend well. 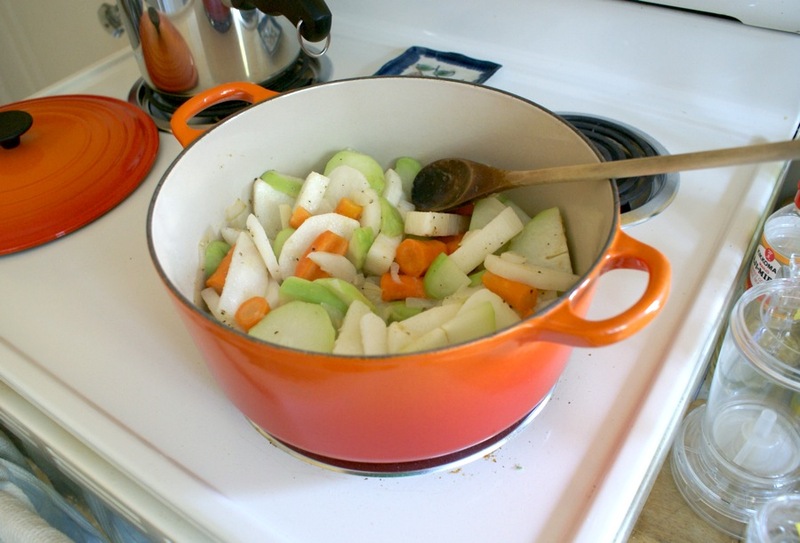 Tip this out into your stockpot or large saucepan. Crush up the rest of the rice, add another cup of water, and blend well. When done, tip this out into your pot too. 3. Add the remaining cups of water into the pot. (I have found that I like the consistency of about seven total cups of water. If you want it thinner, use more water.) Bring to a boil and turn the heat down to medium. Meanwhile, make sure that you stir continuously. Until the rice is cooked, it will sink to the bottom of your pot. If you don’t mix continuously, you will run the risk of burning the bottom. 4. Add the sugar (this can be honey, or a mixture of the two… or you can be silly like me and use powdered cactus honey which was purchased some time ago on a whim). As the sugar dissolves, you will notice that the consistency of the soup has gotten thicker. After about 5-8 minutes, the sugar is completely incorporated and the cooking is done. 5. You can try using an immersion blender, but I prefer letting the soup cool a little and blending it in a normal blender. Blend the finished soup to make sure that you have a silky texture (it’ll lumpy if you don’t… perfectly edible but totally lumpy).